For example, if your standard exposure without the filter is 1/500 @ f/8 and you then set the filter to "Min", you change the shutter speed to 1/125 at the same aperture - thereby losing 2 stops of speed while gaining a hint of "blur" in the image. If that's not enough filtration, continue rotating the filter until you reach the shutter speed you desire. 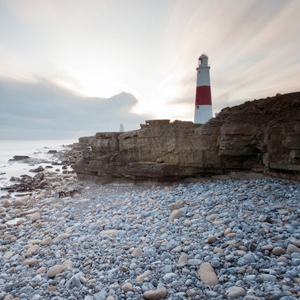 Using the above example, you can even get down to 1/2 second @ f/8 (8 stops). It should be noted that the calibration marks on the filter ring are to be used only for reference and should not be regarded as accurate settings for specific densities. 58mm Variable Neutral Density Filter is rated 4.3 out of 5 by 730. Rated 3 out of 5 by Delphineous from Bulky but effective The design of this filter is compact in comparison to stacking ND filters, however it is large enough that I cannot use it with my lens hoods. The Max setting, combined with f/22 aperture, allowed me to shoot into the sun. There is considerable vignetting, though. On my 5DmkII, the edges of the filter are in frame at the corners below 40mm. This filter will allow you to turn beyond the Max position. doing this introduces anomalies of uneven exposure across the frame - just as warned by the package enclosure. This effect is not seen within the normal operating range. Rated 4 out of 5 by anglereserve from Great Value This variable ND is great for the price. The build quality is there and, for this type of filter is pretty clean offering very little color cast or loss of sharpness. One thing I don't like is that the Max/Min doesn't have any hard stops (rotation limits) to prevent the X pattern that can happen when exceeding the markings on the filter barrel. Because the reading lands differently on different lenses when screwed on, you can find yourself checking it at weird angles. The velcro pouch it comes with is also a nice, added value. Minus one star for no hard stops, otherwise a solid 5 for a hundred bucks. Rated 5 out of 5 by Zbyszek from Good product The filter performs as advertised. We are warned that a cross pattern might be seen near the minimum transmission setting or the filter but I could not get it. There is a colour shift instead. Otherwise it works very well. Negatives: 1. The filter being 77 mm in diameter is set into a ring with diameter so large that on no 77 mm lens I have the lens shade can be used once the filter is mounted on the lens. 2. The soft envelope-type pouch supplied with the filter is a very good idea but the one supplied with this filter is too large. With the camera bag space at premium a smaller pouch would be a very nice thing to have. Rated 2 out of 5 by Dan from Does not work as intended! Bought this for use on my 5DII on my 24-105 canon lens. Simply put, you will not get usable ND filter between 2-8 stops. Beyond about 3.5 stops or so, there is CLEARLY nonuniform blotchiness. Sure you see the dreaded black X beyond 8 stops (revelation: you actually see it at about 6-7 stops). So, if all you want is a good ND filter from 2-4 stops, this will work fine; of course, I'd save the money and buy a couple of individual NDs and skip this thing. Oh, at 24mm, borderline vignette; stack even the thinnest of filters on top, major vignette. Rated 5 out of 5 by Abu from Great Filter This is my first ND filter so I am not comparing this to any other ND filter. I have used it a few times in the last month that I have had it and the effects are wonderful. The only down side I see of this is that the threads on this filter are not as smooth as some of the other filters I have. So be careful when you screw it in. And once you are ready to turn the from ring to get the desired density be careful that the filter does not unscrew. It does what it is supposed to do. For someone using it for the first time here are some pointers. - Switch to Manual Focus - Do not depend on the camera metering - Careful while turn the front ring. Rated 5 out of 5 by David Y from Good for the Price Wanted something that was variable so I would have to keep swapping my filters. I watched a review which tested 6 different ones. Tiffen seemed like a logical choice. Thus far it works and doesn't seem to impact the sharpness. Also, just have to remember a couple of things. 1. Don't go to the max of the settings (I always back off 1 notch). Or else you will get the famous X 2. Make to adjust your White Balance before taking the shot (common anyway). But, overall for the price and versatility I am happy with it. I normally carry different filters and have to take the time to swap them out. Sometimes not a good idea, when the family is waiting for me to finish. Rated 3 out of 5 by Martin from Works, but not with wide angle lenses I use this for shooting video in bright light, in order to have more control over depth-of-field. It does a great job with only the slightest color shift, but doesn't seem to work well with focal lengths smaller than 50mm (on a crop sensor) without getting the dreaded X pattern. No vignetting with wide angle lenses, even at 10mm, but useless with those lenses except for the minimal setting (2 stops). Not sure if this limitation is just for this filter, or if all ND filters suffer from this, but it's not nearly as versatile as I had hoped. Rated 1 out of 5 by Colin from wouldn't buy it again... As with other reviews, there is serious vignetting and exposure banding, but at it's max density the blue/cyan shift was so severe as to render my images unusable. Since I didn't discover this until after the BandH return period had expired I had to deal with Tiffen customer service. While they did replace the filter, it was only after a lengthy written explanation that it wasn't my lens/camera combo that was the issue but their filter. You can see the blue shift just putting the filter up to your eye. It's the worst I've seen in 40 years of using ND filters. Unfortunately, the replacement filter suffers the same blue/cyan shift, although not as pronounced....for the price you pay for this, it's not worth it!!! Buy something else! Can I still get lens flares? Is it possible to do 0 stops when attached? Or is the minimum 2 stops? The least amount of ND is 2 stops. There is no zero ND. The Tiffen 52mm Variable Neutral Density Filter does not have front filter threads. Can this filter be used on Tokina 12mm-24mm lens without vingetting? There is a good chance that there will be vignetting on the Tokina 12-24 when using a variable ND filter such as the Tiffen 77mm. I have a Canon MIII. Will this Tiffen 77VND work with a 50mm lens? 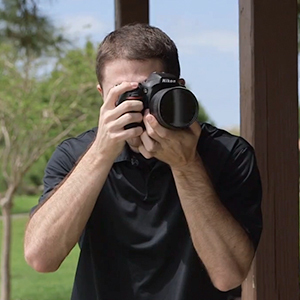 Whether this filter will fit your lens depends on the exact 50mm lens. The front diameter of the lens is generally printed on the front or stamped behind the lens cap. 1. The description doesn't tell if there is a filter thread. My question is, can I stack another 77mm ND filter on top of this filter to further increase perhaps 3 stops ND effect?2. I was wondering if I use a step up ring, will vignetting disappear? Say if my lens has filter size of 67mm, and I use a step up ring to put on this 77mm ND filter. Since the filter is larger, will be reduce or able to even avoid vignetting issue for wide angle lens such as 12mm etc.? Thank you! 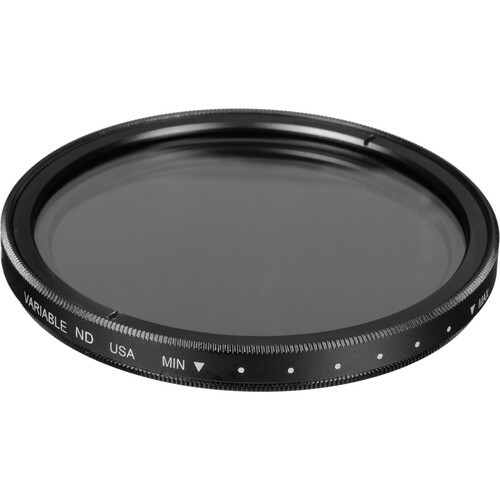 There are no front filter threads on the Tiffen 77mm Variable Neutral Density filter. If you use a 77mm variable ND filter on a 67mm lens with a step up ring, this will help to decrease vignetting, yes. There is, however, no guarantee that vignetting can be eliminated in this way. Yes, you must rotate the filter to adjust the density of the filter for your image. without front threads, what lens cap can I use this filter?